NETWORK FINALS: The SUPERSTORE rerun gained 0.1 and the THIS IS US rerun lost the same in final numbers. In addition, as expected after adjustment for a preemption in NY, both the reruns of ARROW and LEGENDS OF TOMORROW dropped 0.1. CABLE HIGHLIGHTS: Syfy’s BLOOD DRIVE debuted at 0.24. That’s not a bad number for Syfy considering that the renewed WYNONNA EARP premiered at 0.20 (on a Friday in April 2016), but it’s a long way from the 0.55 premiere of Z NATION in 2014 (on a Friday in September). Bravo continued on top of Wednesday cable with REAL HOUSEWIVES OF NYC, down a tick from last week to 0.54, with lead-out THEN & NOW steady at 0.19. ESPN’s 30 FOR 30 Celtics vs Lakers documentary continued to perform at 0.49, although down from Tuesday’s 0.67/0.57. On Discovery, an ALASKAN BUSH PEOPLE special was at 0.48, leading into the season premiere of HOMESTEAD RESCUE at 0.34. TBS’s FULL FRONTAL climbed 0.05 to 0.45. On HGTV, BROTHER VS BROTHER jumped 0.11 to 0.43, HOUSE HUNTERS grew by 0.15 to 0.40, and HOUSE HUNTERS INTL was also up 0.15 to 0.37. The tenor of yesterday’s news favored Fox News, which was led by TUCKER CARLSON TONIGHT at 0.39/3M, while MSNBC’s RACHEL MADDOW SHOW was at 0.33/2.7M, and CNN’s ANDERSON COOPER 360 was at 0.31/1.4M. Comedy Central’s THE DAILY SHOW notched another Top 10 result at 0.39. On Lifetime, LITTLE WOMEN LA was steady at 0.36, and MONIE GETS MARRIED held at 0.29. Nickelodeon’s LOUD HOUSE continued to own late afternoon at 0.35. On ID, REASONABLE DOUBT ticked up to 0.30, and HEAR NO EVIL was down 0.02 to 0.25. FX’s FARGO rose a tick to 0.29. 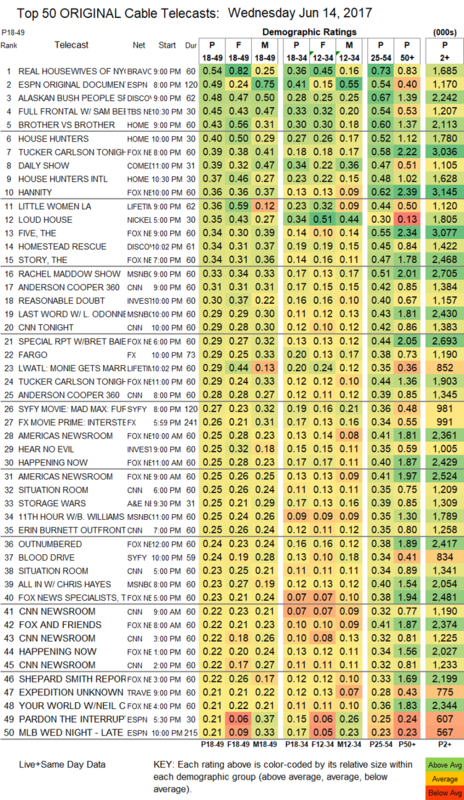 A&E’s STORAGE WARS was at 0.25/0.21, compared to last week’s 0.22/0.20. On Food Network, COOKS VS CONS lost a tick to 0.21, and CUTTHROAT KITCHEN was also down 0.01 to 0.19. USA’s BIG STAR LITTLE STAR gained 0.04 to 0.21. E!’s HOLLYWOOD MEDIUM shed a tick to 0.21. MTV’s TRUE LIFE slipped 0.02 to 0.16, and an 11PM episode followed at 0.13. 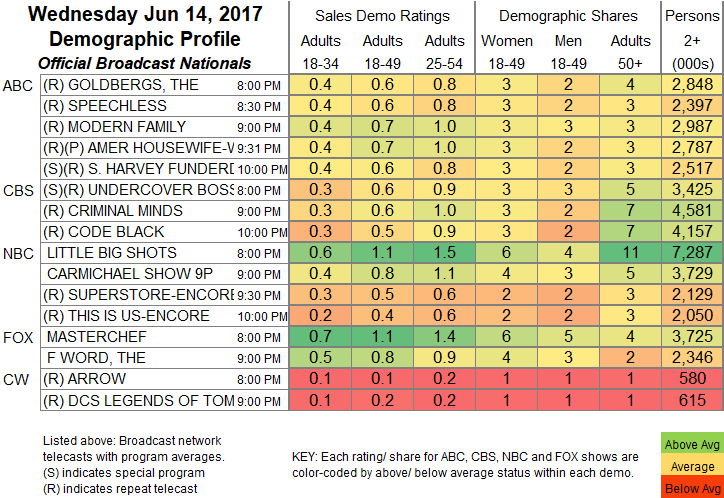 On TV Land, LOPEZ and NOBODIES returned from a week off at 0.06/0.06. Below the chart, POP’s NIGHTCAP remained at 0.01/123K, Sundance’s GOMORRAH had a 0.01 bump to 0.02/79K, and Showtime’s PUTIN INTERVIEWS also inched up to 0.03/123K.